Acoustic augmentation is an installation which explores the use of sound as a tool for manipulating people's understanding of space. Through the deployment of custom built, sensing-speakers, we were able to track and interpret people's interaction with a space (a stairwell in this case) and then influence that interaction with sound. Stairs are a unique architectural device in that they have an inherent physical bias which creates distinct physical sensations based on the direction of interaction (up or down). This creates a unique opportunity for exploring how sound can influence people's understanding of space. Stairs also have a unique place in the history and landscape of Pittsburgh. The city has 739 runs of outdoor steps (shown in blue in the accompanying map), several as long as a quarter mile with no landings. These stairs date back to the steel era when they were used daily to bring workers down to the mills in the morning and back up to their houses at night. Of these 739 steps, 344 are legal streets. Many are complete with street signs, and often times houses. We were captivated by this artifact of industry and wanted to capture the relentlessness of these steps in our installation. We explored a number of acoustic devices in search of a mechanism to help us create the physical engagement we were after. This led us to Shepherd Tones, an auditory illusion where in a pitch seems to be infinitely increasing or decreasing when played in a continuous loop. By pairing a rising tone with downward movement on the stair, and a descending tone with upward movement, we were able to exaggerate the physical sensations associated with zipping down, or trudging up a set of stairs. 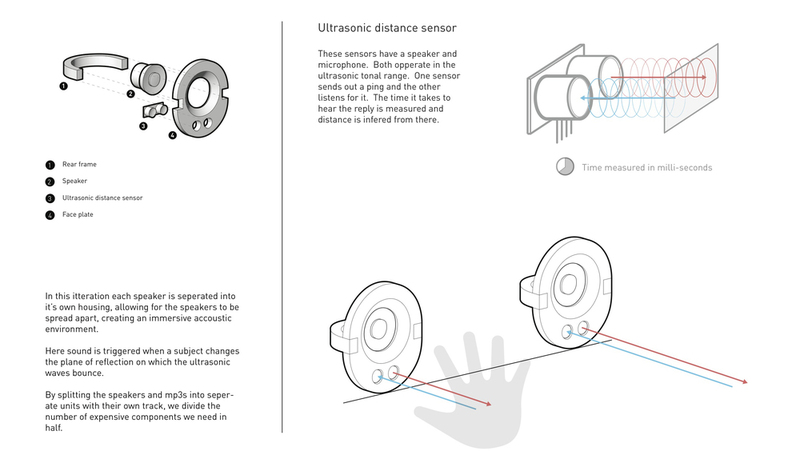 To create the most seamless interaction possible we designed and tested a number of different styles of sensing speakers. These experiments involved various types of sensors and allowed us to developing increasingly nuanced understandings of peoples activity on the stairs.